that contained one lighter, a 4 oz can of fluid, and a years supply of flints. The first gift set used the same silver Deco style packaging till the late 40s. Only the content changed. The pocket lighter box design changed many times over the years. This section shows photos, along with a brief description, of when the box was used. The dates given are approximate, as there is no conclusive timeline for them. The purpose was to return lighters safely to the customer, after the lighter was serviced, repaired, or had signatures or logos applied. 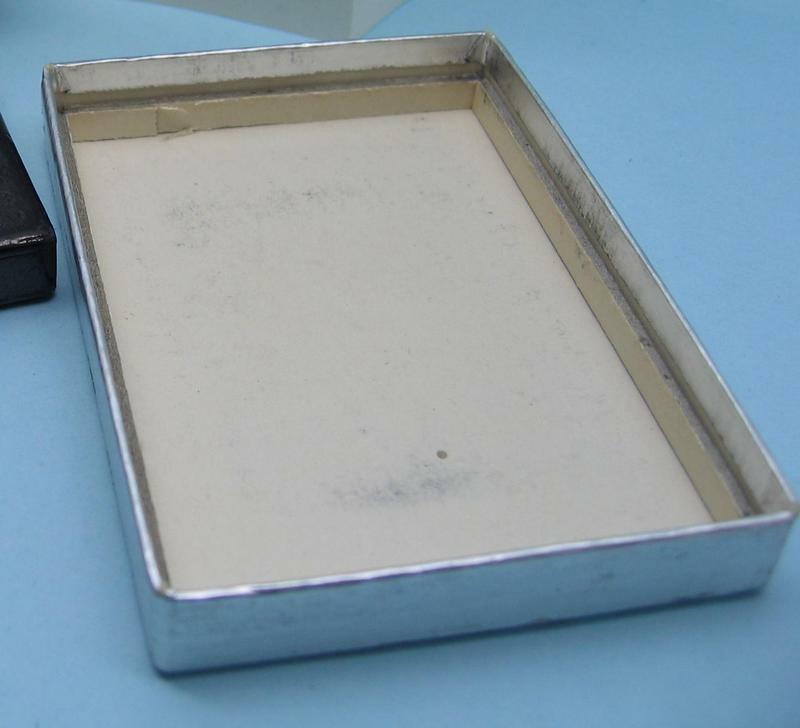 This box was used for sales of new lighters, as well as a return box for customers sending their lighter in for service. 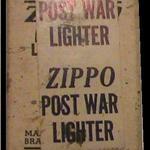 There was another one with a label stating "POST WAR LIGHTER" made from this same box. In the middle of 1946 the box was changed again. The WINDY girl was removed, but the flag remains in the bottom left corner. The depth of both the bottom, and the lid, were much deeper at this time, compared to boxes from previous years. The MOUNT that held the lighter was red, very thin and fragile. I call these "Red Flag" boxes. The earlier 1/2" Deep lid used from late 46 to early 47 has no cardboard spacers inside the lid, compared to the later 47-49 lid. There were two styles of "mount" used. Both red in color. The depth and material thickness were different. The earlier (thin) mount shown in the thumbnail photo was much thinner and used from 1946- early 47. It is my belief that these boxes, with red mounts, were used for the slightly taller Nickel Silver case lighters. The mount and box base had no writing on it. You will rarely see one of these. I am aware of only 2 others in personal collections. Very desirable.. It's rumored to have been pulled from circulation due to the image having a liitle too much exposed for that time period. Complete with original instruction booklet. I have named this box the "Red WINDY Box" for obvious reasons. with the use of the iconic WINDY Girl lighting a cigarette in a gale. The box under-went a new design change and featured WINDY in a gale, with leaves blowing as well as artwork showing the wind along with the leaves.
" A WEEKS TRIAL, THEN ALL THE WHILE "
The case was no longer square and had much more rounded corners, therefore, a new mount was designed, to accomodate either shape. Both mounts had no writing on the inside. I have had a few of these boxes. They differ from the later, more common, WINDY box. This box lacks the leaves and lines that show a storm. This box shows the figure of a lady, lighting a cigarette, wearing a dress on a stormy day. The silver areas on "WINDY" are stamped out to give the box more dimension. 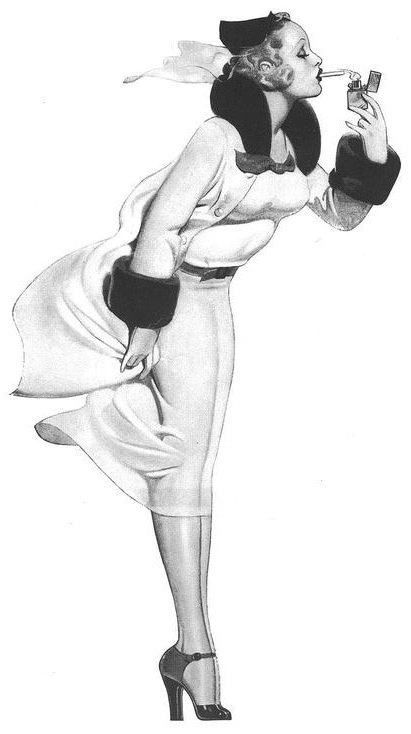 and was used in ZIPPOs first major advertisment, in Dec 1937. The ad was in the gentlemen magazine, called ESQUIRE. The slogan on the box reads:. "A WEEKS TRIAL, THEN ALL THE WHILE"
NOTE: Lid dimensions are ​​2 3/8" W x 3 1/4" H x 7/16" thick. This was the first year for the "All Red" striped box, commonly known as the "candy striped box". This early version has no ® symbol on either the box lid or mount. The mount has the word ZIPPO off-center and to the left slightly along with two decorative lines. The box bottom could be folded back, and the box would become a display stand. Around 1954, the Red striped underwent some more changes. First was the introduction of the ® symbol, added to both box lid and mount. Second was the word ZIPPO on the mount became centered and diagonal lines were added to all four corners. 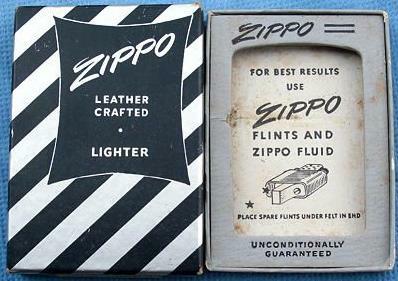 At some point during 1949, Zippo introduced a new "flashier" style of box. It sported the NEW script style logo on both parts of the box, including the mount. The early version still used a thin box base, measuring 5/16" thick. 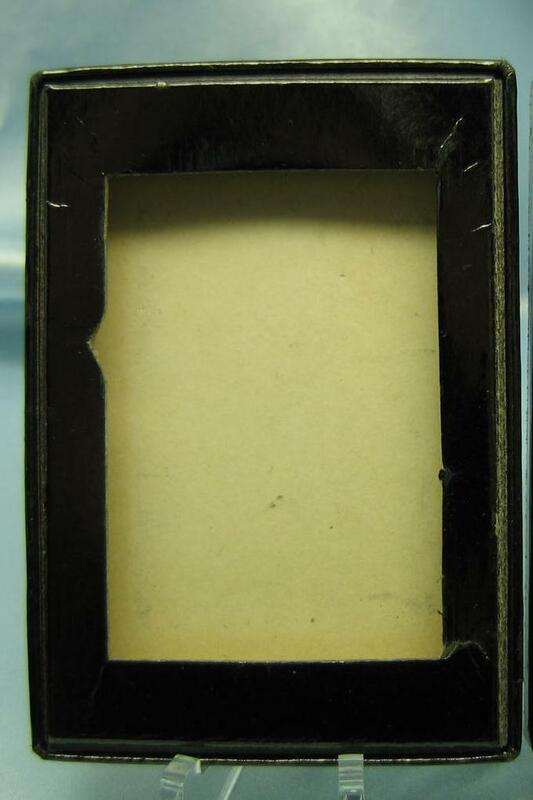 When the thin box bottom was used, the lid of the box has thin strips of cardboard glued to the inside to keep the lid from contacting the lighter. The other box base for this period measured 7/16" thick and when used, there were no strips of cardboard inside the lid. 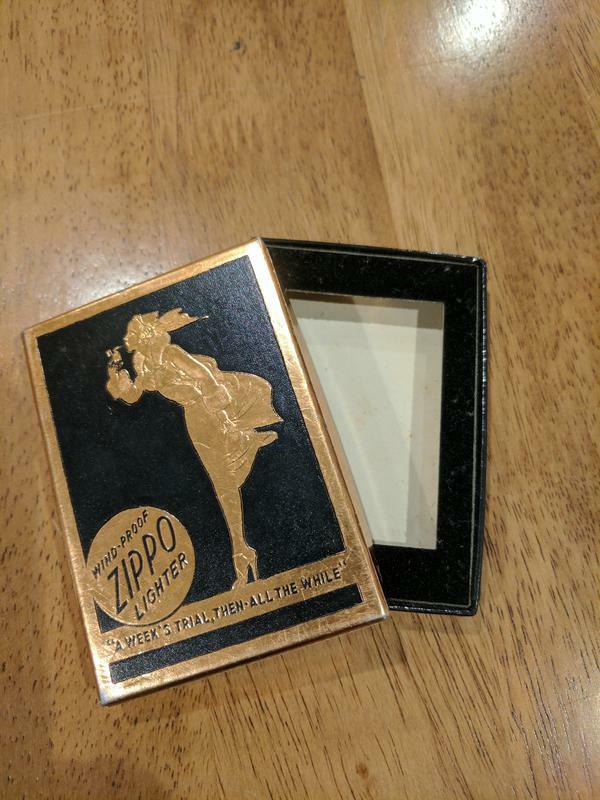 When I first saw one of these boxes I thought someone has mixed up the lid and base from different years, but I have now found that this combination was direct from ZIPPO. The new Red box bottom had a picture showing the lighter insert (removed) on it. It was from this point on, that the bottom of the box used, was 7/16" thick and the use of cardboard spacers was discontinued. Most commonly, 1952s came in this box, but I also have some late 51s & early 53s come this way. During WWII the box became more simplified. It was at this time that ZIPPO was making lighters out of painted steel. Heavily coated with a black a crackle finish, and distributed amongst the men and women of the military, and stopped selling to the general public. 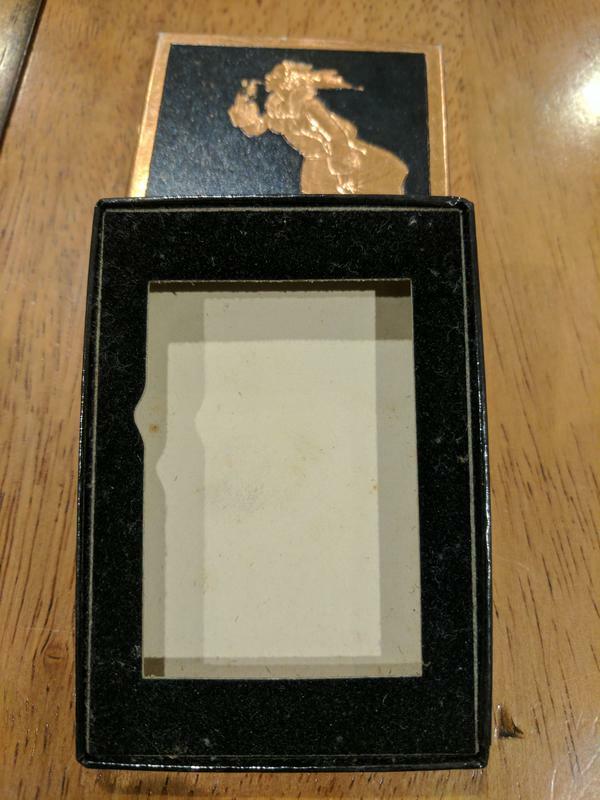 This simple, smaller box had a picture of the "Black Crackle" lighter on the front and the instruction booklet was folded, and tucked inside the box. The box on the right was used after the War for retail Zippos. It made sense to use up all old stock WWII boxes, and add a label over the existing ones. This type of packaging is very difficult to find as the majority would have been thrown away. The first gift boxes came out in 1933, and there were changes made to them within the first two years. Both boxes have a real Art Deco feel to them. The first was Black, with a silver building. There are only 3 known examples of the first box including mine. The dimensions of the lid on the 2nd design are 2 3/8" W x 3 1/4" H x 7/16" thick. The original boxes have a strip of cardboad inside the lid to raise it above the box bottom. There are reproductions of this box that are of slightly different dimension, and lack this strip of cardboard inside the lid. Extremely rare original GREEN shipping box, used to ship lighters from ZIPPO to the customer. This box is post marked with a P.O. Box # for ZIPPO. ​I have only seen a couple of these. The Niagara Falls Zippo plant packaging was similar to the Bradford Plant Packaging. There were subtle differences when one looks closely. This box looks just like the 1949-51 USA box, but observe the ® on both the lid and the mount. The word ZIPPO on the mount is left of center, the same as the 49-54 USA version, But this Canadian box is from the mid to late 50s (shown on the right). The earlier 1949-54 (on the left) lacks the ® but still uses thumb cutouts. To my knowledge Zippo Canada never used a red striped box. The early 60s brought this style of box, and the Niagara Falls plant used this till the late 70s. The use of "REG'D T.M." were used at this time on the lid, and " Reg. T.M." on the Mount. 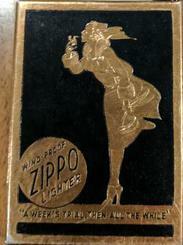 Zippo also had fancy gift boxes for their Gold, Gold Plated, Silver and Silver Plated lighters. 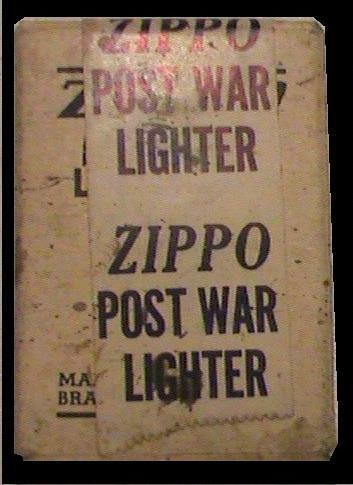 Around 1950 ZIPPO began making hardshell cases for their solid and or plated lighters. This case has a stunning soft liner as you can see. The outside of this case is covered in a deep green leather with gold leaf detail. 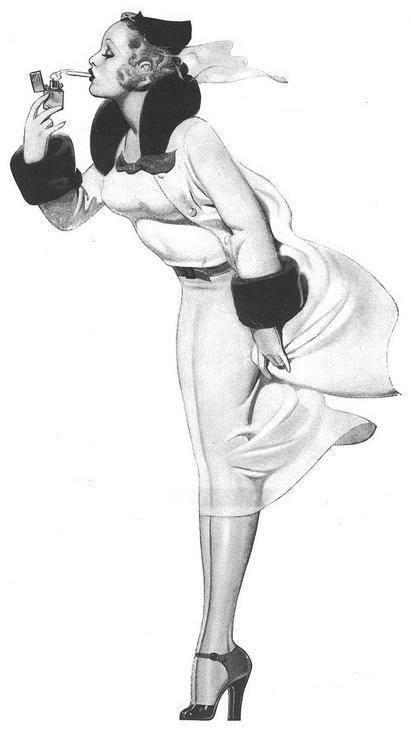 This one dates to around 1954 with the ® symbol. There was another version in blue leather. This grouping shows 3 variations. Gold, Silver with smooth mount, and Silver with satin mount. These boxes were specially made for zippo lighters that came from the factory with applied logos. When an order was placed for company logos to be put on at the Zippo factory, it was necessary to make a box deep enough to accomodate the now thicker lighter. The stripes on the box were different than the regular black striped boxes of the time, as the stripe was much thinner than the standard striped box. In 1964 the Logo became centered. Sometime around 1968, the word LIGHTER was added, and the logo location was changed once again. This Christmas Box was used in late 1948. The mount had information written on the inside for the first time. Zippo added a paper label stating "Merry Christmas it's a ZIPPO"
There were many changes to packaging beginning in the late 70s. The logo changed, the mounts made from plastic and simulated felt began to appear. Specialized boxes for the plated lighters or commemoratives also started to appear. The mount is unique, in that it was made from felt covered cardboard. I am still doing research as to what this box was specifically desiged for. There are some books that suggest it was a protype box, but I haven't seen enough evidence to support this claim. This was found in a WWII chest,then sold to me.